When gardening on a slope, keep kitchen herbs on the front row, within easy reach. Here prostrate rosemary tumbles over a section of retaining wall made of logs. 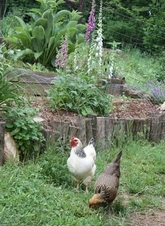 Running beds across the slope reduces erosion and gives you almost level footing in the pathways. Terraced beds are accessible in wet spring weather, because the pathways bear the weight of human activities. After much trial and error, we have settled on 18 to 24-inch long rebar stakes as the best way to support retaining boards. 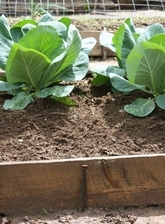 Wood stakes rot too fast for this job in a hillside vegetable garden. 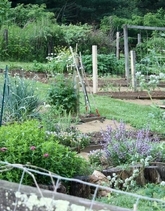 One of the great things about a hillside garden is the emergence of natural layers of texture. Useful herbs including catnip, valerian and lemon balm reseed naturally, asking only for a small space to grow. 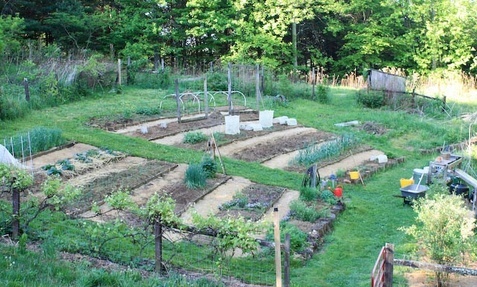 Gardening on a slope will keep your leg muscles strong, and it's a beautiful way to grow great food. 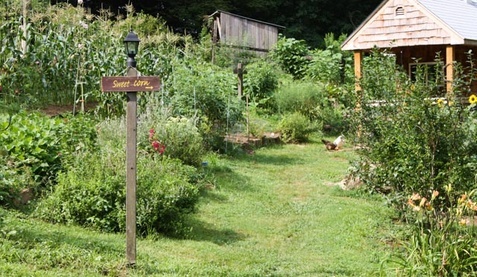 Our hillside vegetable garden is on a northwest-facing mountainside at about 2,700 feet elevation. The elevation and exposure puts us in Zone 6b. The basic soil type is acid mountain clay, but after years of improvement it's now clay loam. 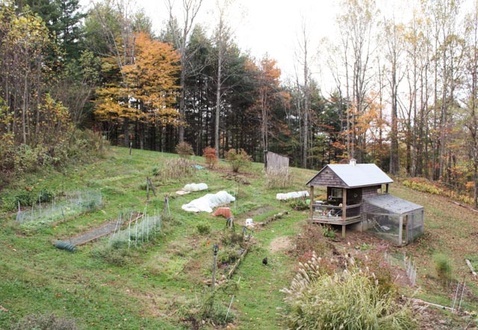 Here I'm posting photos and observations that may be of interest to others who are nurturing dreams of a beautiful hillside vegetable garden. Ours is made up of about 20 permanent beds that are terraced into the hillside. To retain the beds, we use untreated boards from the sawmill down the road. The boards eventually rot and need replacing, but that's an easy job to take care of in spring. One-inch thick poplar boards worked well enough, but we have replaced most of them with thicker hemlock, which was the sawmill special a couple of years ago. 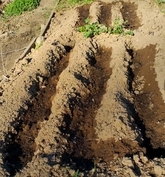 To reduce soil erosion and increase light exposure to plants when gardening on a slope, it is best to run permanent beds and planting trenches across the slope in a hillside vegetable garden. 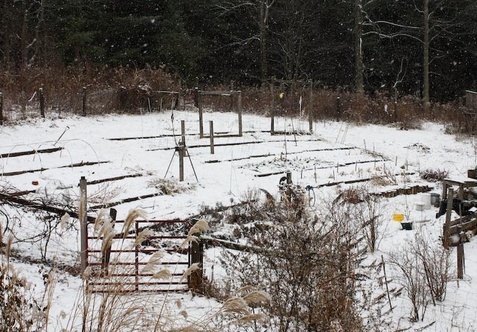 I love the visual drama of our hillside vegetable garden. 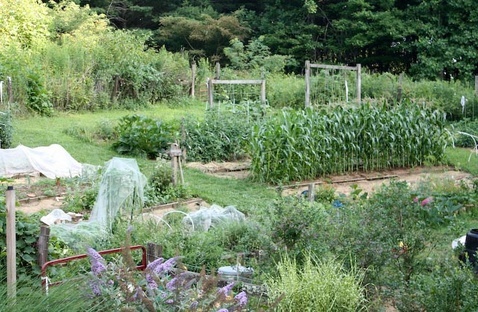 The tiered beds show off the changing tableau of crops like actors on a stage. And though I'm sure climbing up a stiff hill twenty times a day is good for you, it's the only aspect of gardening on a slope that gets tiresome. 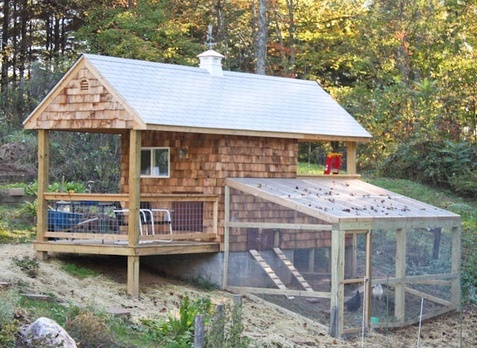 Instead of trying to garden in the steepest, shadiest corner of the garden, we built a beautiful chicken coop with attached decks -- one for garden stuff and one for people. Eggs can be gathered from the little deck. This year we did some serious cleaning up along the woodland edges, which revealed two beautiful stands of woodland ferns. Next year I plan to plant more.